I've just phone interviewed Anthony Walker, of Bentley Walker Ltd, about their recent announcement of all their iDirect hubs with iDX3.1 software licences. Bentley Walker have upgraded all their iDirect hubs to the new iDX 3.1 platform to allow operation with the new low cost iDirect X1 satellite internet access customer terminals. These terminals provide users with satellite broadband, web site access, email, VoIP etc. Where has it been applied ? This upgrade applies to Ku band networks in South America (AB1 and T12), in the Middle East and Afghanistan (Eutelsat W6 and W7) and Africa (W3 A and T11 ). In C band, it applies to networks in Africa (W2A and AMOS5 A). In Ka band, it will be deployed on Hylas around July /August 2012. The new iDirect X1 customer router is smaller and lower cost and is expected to be very attractive to the loyal iDirect user base of local installers and local service provider operations as well as to new government, utility and commercial customers operating over large areas. Utility companies (see below) are expected to be particularly interested in this new technology as it is well tailored to narrowband inroutes with very large number of terminals and very small inbound data rates. Unusually the iDirect X1 router terminal comes as either a conventional model intended for indoor use or as a sealed external outdoor weatherproof box suitable for pole mounting in association with equipment, street level radio linked utility metering, SCADA, remote monitoring, telemetry, weather sensors, seizmographs, water levels, security cameras etc. At April 2012, iDirect X1 was available for use only on the eight Ku band iDX3.1 networks operated by Bentley Walker as shown on the right. Ka band service is due mid 2012 in Europe, Middle East and Africa on Hylas. Large-scale narrowband networks are a key application for VSAT satellite communications. Today, this segment of the market is growing in sophistication and industry reach, presenting new opportunities for service providers. For example, power, gas and oil utility companies require narrowband connectivity to support SCADA monitoring at remote substations. They also need narrowband to backhaul smart meter data across thousands of rural collection points. Finally, utility companies need to provision substations for on-site video surveillance, data access, VoIP and backup communications. And they need everything to run on the same system. Networks like these typically have a large number of individual sites with remotes that are often idle for long periods. To be competitive, service providers and operators need a cost effective solution designed with bandwidth-efficient and energy-efficient hardware. And they need an easy, quick and affordable way to install and manage a large amount of network devices in the field. The latest operating software release for iDirect's innovative Intelligent PlatformTM, iDX 3.1enables service providers to offer narrowband service and support large-scale networks affordably while integrating with high-speed enterprise networks. The iDX 3.1 release has several key features. iDirect is introducing a cost-effective remote bundle optimized for large networks with small inbound channels and single client applications. The bundle includes the new Evolution� X1 remote, a low power, compact remote that comes in an indoor and outdoor version, as well as a highly efficient BUC and LNB. The X1 features DVB-S2/ACM and TDMA, basic routing, VLAN functionality and QoS. The outdoor version, with an IP67 weatherproof casting, offers an extended temperature range, passive cooling and multiple power options, including DC. The bundle can also run on rechargeable battery power using solar or an alternative power source. The X1 remote is complemented by a new licensing option for iDirect's XLC-M line card. This option enables the XLC-M to support a 16-channel narrowband inbound configuration. When coupled with an Evolution modulator card, such as XLC-11 or XLC-10, it is ideal for networks featuring one large outbound and multiple inbounds supporting voice, data and video applications. With iDX 3.1, iDirect Group Quality of Service has been enhanced to support active, idle and dormant states. This enables utility companies to manage network traffic more efficiently by automatically adjusting to the bandwidth requirements of inbound application needs. Unlike narrowband systems that are contention based and cannot guarantee minimum availability requirements, iDX 3.1 minimizes idle remote bandwidth without losing the benefits of a deterministic access scheme. For organizations with a mix of critical and non-critical applications on the same network, this balances efficiency with responsiveness. Finally, service providers can commission networks more easily through iDirect's enhanced Web iSite tool, which makes Web-based network configuration simple and seamless. Europe, Middle East and Afghanistan: Ku iDirect Evolution x1 on Eutelsat W6 satellite at 21.5E. Western Africa iDirect X1 service, Ku band on Telstar 11N at 37.5 west. Turkey, Egypt, UAE, Afghanistan, South Sudan, Eastern Congo, Uganda, Kenya, Tanzania, South Africa, Zimbabwe. 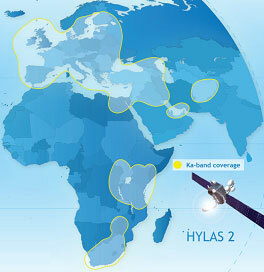 Hylas 2 Ka band Due to start mid 2012. West and southern Africa iDirect Evolution X1 service, Ku band on Eutelsat W3A at 7 east. The above information is derived from discussions with Bentley Walker and is not a paid for advertisement.